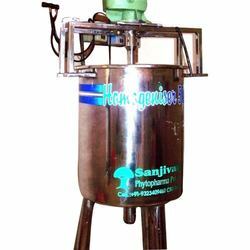 Leading Manufacturer of homogenizer mixing tank from Navi Mumbai. Our valued clients can avail from us appropriately designed Homogenizer Mixing Tank. These products are manufactured and designed using supreme quality stainless steel and other required material, procured from the established vendors of the industry. To satisfy diversified demands of the clients, we offer these products in different sizes and specifications. Looking for Homogenizer Mixing Tank ?